Greenville’s Noah Walker signs to play basketball for Heidelberg University. L-R: Shellie Walker (mother), Walker and Chet Walker (father). Back: Greenville coach Kyle Joseph. 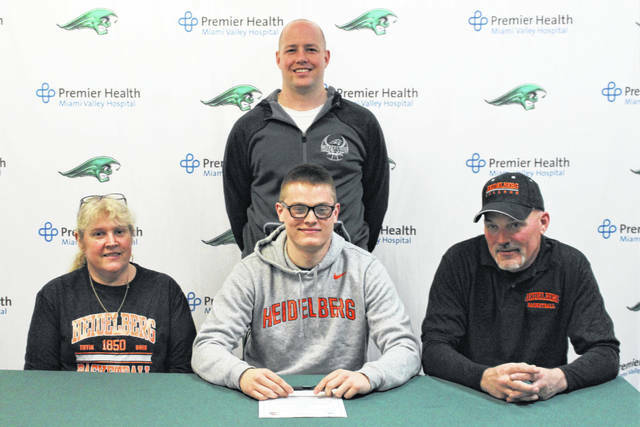 GREENVILLE – Greenville senior Noah Walker committed to play basketball for Heidelberg University in a Friday signing at Greenville High School. Walker, the son of Chet and Shellie Walker plans to study sports management and business while continuing to play the sport he loves. Walker’s high school basketball coach, Kyle Joseph is pleased with Walker’s choice of Heidelberg to continue his education while taking his game to the next level. Coach Joseph not only is pleased with Walker’s play on the court, but gave the Greenville senior high marks away from the game of basketball. Walker took time to reflect over his four year career playing for the Green Wave. Heidelberg University, an NCAA Division III program is a member of the Ohio Athletic Conference (OAC) including; Baldwin Wallace, Capital, John Carroll, Marietta, Mount Union, Muskingum, Ohio Northern, Otterbein and Wilmington. The Heidelberg basketball team is coming off an 8-18 season including a 6-12 conference mark. https://www.dailyadvocate.com/wp-content/uploads/sites/34/2019/04/web1_IMG_6769.jpgGreenville’s Noah Walker signs to play basketball for Heidelberg University. L-R: Shellie Walker (mother), Walker and Chet Walker (father). Back: Greenville coach Kyle Joseph.